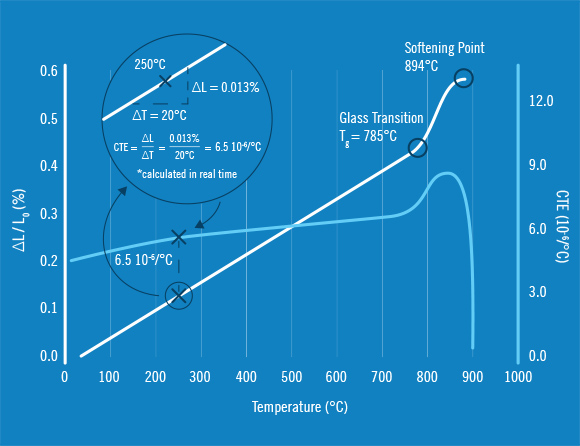 Comparison of a ceramic’s thermal expansion before and after firing gives insight into its behavior across a range of temperatures. This data is valuable in refining the firing process, and understanding how a material performs in high-temperature applications. The unfired raw ceramic (white) undergoes a variety of complex irreversible changes (X) such as diffusion, water expulsion, chemical reaction and sintering, as well as reversible overall thermal expansion. 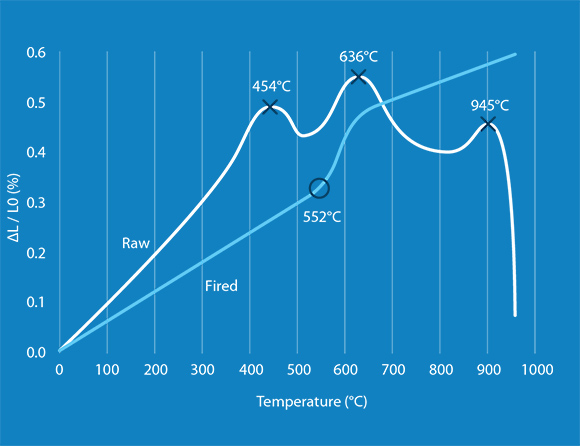 In contrast, the fired ceramic (blue) exhibits only thermal expansion and a phase transition (O) at 552ºC, demonstrating the overall effects of firing and the resulting fired ceramics thermal expansion behavior. Glazing is a critical process in the final production of ceramics, from capacitors to cookware. To ensure a properly glazed ceramic, the Coefficient of Thermal Expansion (CTE) must be considered for both the glaze and the base ceramic. Ideally, the glazing exhibits a slightly lower CTE than the ceramic to facilitate a tight lamination. A larger glaze CTE can result in cracking and a weaker finished product, due to a CTE mismatch between the glaze and substrate. A ceramic glaze (white) was heated through its glass transition point (Tg) at 785ºC and to its softening point (894ºC). The resulting CTE (blue) is calculated and displayed in real-time via the right y-axis.